Who were the Aquitaine people who contributed to the independence of the USA? Like in all the coast régions, many sailors from Saintonges, Basse-Guyenne, Paus de Buch and Pays Basque boarded the squadrons of the roayl navy that brought troops. A few privateers from Gironde also took part in the events. 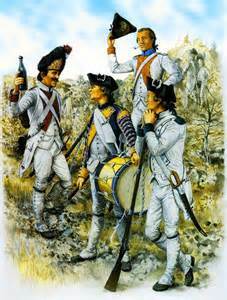 Among the 84.000 French fantassinswho would have take part a way or another to the Independence war of the USA, they must have been people men from Aquitaine. Let's also take into account the contribution of the civilians, in ports and cannons factories of the South West. About 60 of those fighters are currently represented by their descendants in French-American friendship societies such as the Society of the Sons of the American Revolution or the Cincinnati.